Finally - that's all I can say - the pattern for these mittens has finally been published. 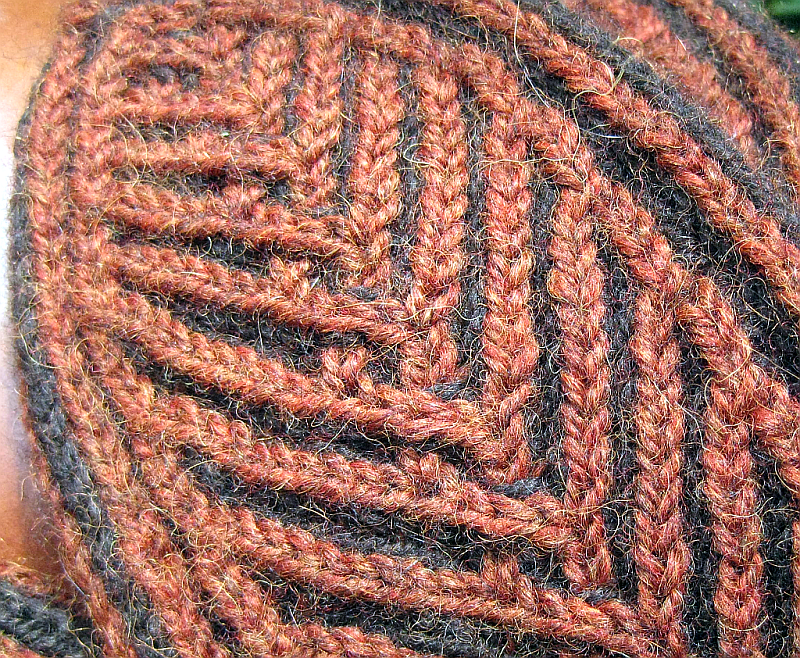 I created this design way back in September of 2010 as a part of the Project Yarnway design challenge over on Ravelry. I made the original pair using worsted weight Berroco Ultra Alpaca. I wore them all last winter and loved them. I made a second pair under contract for another Raveler using the same yarn. But after a season of wearing the mittens, I decided that they might fit a little bit better with more negative ease. The problem with trying to make the design smaller is that the number of stitches in the pattern doesn't really lend itself to modification. I swatched with less stitches and the cable motif just didn't have the right look. If the pattern itself couldn't be altered, then my only option was to go with a different gauge. I needed more stitches per inch. I swatched with Berroco Ultra Alpaca Light, a dk weight yarn, went down a needle size and came up with a mitten with a finished size of 7" around the palm. But due to the stretch inherent in Brioche stitch, these mittens easily stretch to fit my 8" hand. The negative ease makes for a great fitting mitten that hugs my hand. A second benefit of Brioche stitch in a mitten is that the fabric is essentially a double layer, with lots of space to trap air and create warmth. These babies are warm. If you'd like to make these mittens, you'll need 1 skein each (1 oz/50 g) DK weight yarn in 2 contrasting colors – Yarns tested include Alpaca with a Twist Baby Twist, Berroco Ultra Light, and Knit Picks Capra. Minimum of 110 yds/100.5 m yardage required in each color. Yarns with greater than 50% cotton, bamboo, or silk are not recommended. A down loadable electronic version of the pattern is available here for $4.00 buy now. You can pay with pay pal or a credit card. A link is also available in the Verdigris Knits Designs page above. 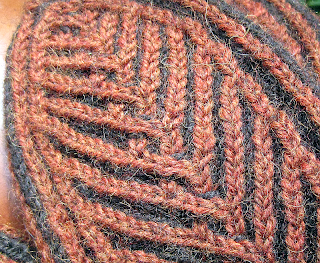 This written pattern uses Brioche terms and abbreviations as established by Nancy Marchant in her excellent book Knitting Brioche (North Light Books, 2009) and at her website www.thebriochestitch.com). I've been thinking of creating a group over on Ravelry to try some knit-alongs with some of these patterns. Let me know if you would be interested in that.